"Fish survived 2 weeks in these bags and then were released!" 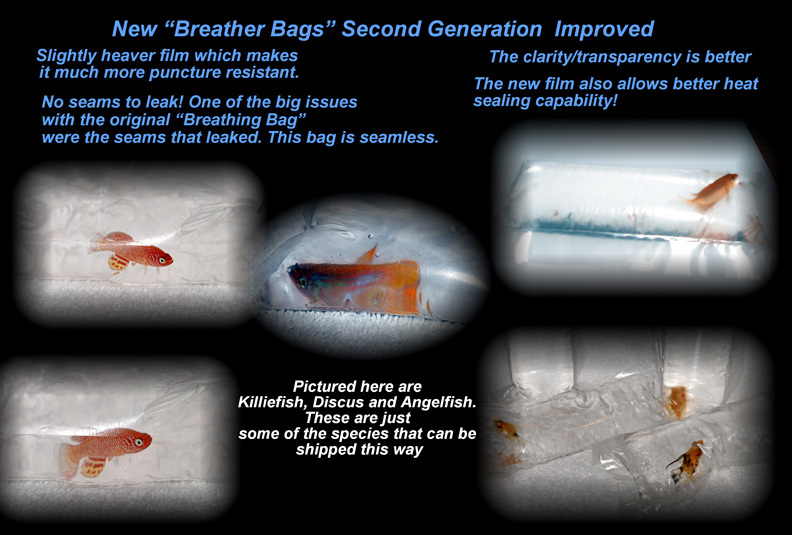 Breather Bags are not a new approach to the shipping of live fish, they have been around for about 20 years. The film used in Breather Bags generates the constant transfer of carbon dioxide out of the water in the bag through the walls of the bag, and the absorption of oxygen from the atmosphere though the bag walls into the water in the bag. This provides a constant source of fresh oxygen for the breathing of the fishes and other aquatic life. Very little water needs to be used thus cutting down on the weight making shipping more affordable. New “Breather Bags” Second Generation Improved! Slightly heaver film which makes it much more puncture resistant. Were the seams that leaked. This bag is seamless. The new film also allows better heat sealing capability! Available in 10” or 6” Bags or Purchased by the foot.